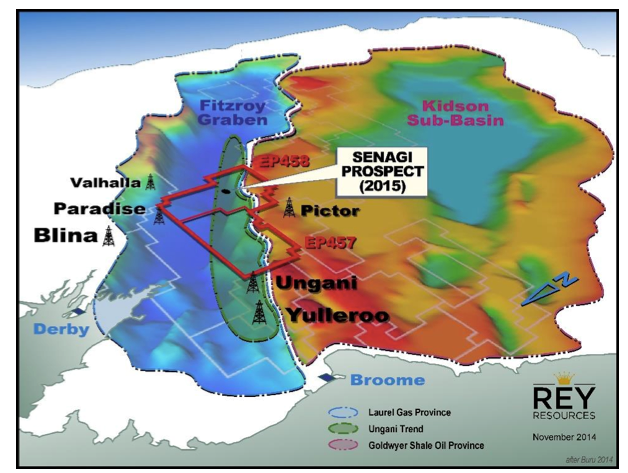 2014 was a big one for Rey Resources (ASX:REY) – it explored for oil and gas far and wide, identified an oil prospect in the Canning Basin, and spudded a well in the Perth Basin that hit good oil shows. REY’s Canning Basin JV partner Buru continued their successful extended production test on the Ungani-1 and 2 wells in the same trend as REY’s ground in the Canning – pumping out 1,200 bopd and over 330,000 barrels of oil for the 2014 year. Drilling – and lots of it. REY and its JV partners have planned an intense exploration, drilling and production programme for 2015 that will see its Canning and Perth Basin oil and gas blocks played with drill bits. 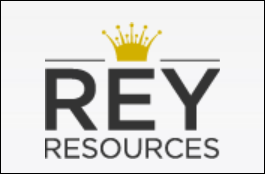 This is great news for REY shareholders like us – plenty of news flow to keep us on our toes, and plenty of opportunities for potential rapid increases in valuation owing to significant discoveries during any one of their drilling events. Up to four wells are planned – two potentially company making wells in REY’s highly prospective Fitzroy Blocks and two more in its Perth Basin block in a JV with Key Petroleum and Caracal Exploration. In the immediate term we are looking out for the flow-back testing of the Dunnart-2 well in the Perth Basin, and in the coming months, the big one for REY investors – the drilling of the Senagi Prospect in the Canning Basin. As we indicated above, the Senagi Prospect is on the same Ungani oil trend where REY’s JV partner Buru Energy has been pumping out over 1,200BOPD on the Ungani-1 and 2 wells. Over 330,000 barrels of oil have been produced in 2014 production testing of those wells – what will Senagi deliver? And the Dunnart-2 well drilled in 2014 by REY’s Perth Basin partner Key Petroleum is going to be flow-back tested in the coming months –expected to be completed in just seven work days. 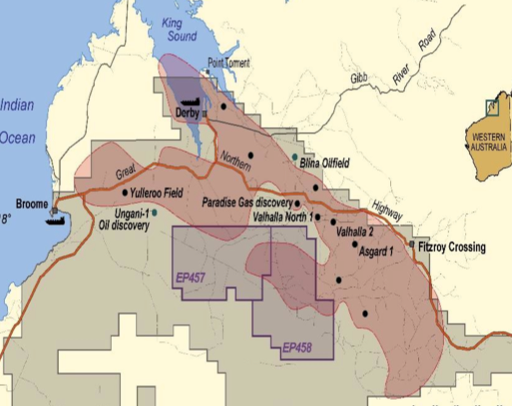 So right off the bat in 2015, REY could be delivering some very good news to its investors from two wells – one exploratory drilling for a big potential prize and one flow-back testing on the horizon. Currently capped at around $75M, Rey Resources (ASX: REY) has an interest in two highly prospective onshore Basins in Western Australia – the Canning Basin and the Perth Basin. These West Australian oil and gas basins are currently being explored as the state’s government and industries look for more local energy resources, rather than importing it from over east or overseas. So REY is operating in a good space – plus it has some key backers that give it an edge amongst other juniors. REY’s cornerstone investor – with around an 18% shareholding is ASF Limited (ASX:AFA), a Sydney based company who act to introduce Chinese partners to Australian business opportunities. This Chinese connection can come in very handy if REY needs to raise capital. And with 2 firm and 2 potential wells plus a seismic survey planned, REY is looking forward to a very busy 2015 – all set up by the hard work it’s accomplished so far. In the immediate term, flow-back testing of the Dunnart-2 well in the Perth Basin will kick off in the coming months. But the Canning Basin acreage contains the biggest potential prizes for REY, with prospects that may well turn out to be company making if they are confirmed. REY has a 25% interest in the Fitzroy Blocks (EP457 and EP458) in the Canning Basin, including 8.3% free carried to production. The company shares the rest with Buru Energy (ASX:BRU, Operator, 37.5% interest) and Mitsubishi (37.5% interest), the Japanese giant. It won’t stop in Q3 – toward the end of 2015 another well is due in the Canning Basin, plus the chance of a second exploration well in the Perth Basin. The Ungani trend was discovered on neighbouring blocks by Buru and Mitsubishi – the same companies REY is partnering with on the Fitzroy Blocks. Ungani 1 and 2 are flowing at up to 1,200BOPD and Buru is now regularly shipping through the Port of Wyndham to oil refineries in Asia. More than 330,000 barrels were produced from this field on the Ungani trend in 2014. This is great news for REY’s blocks, and points the way forward. REY has also inked a strategic alliance with the China National Fuels Corporation that will see REY’s Canning Basin plays supported by one of China’s largest energy companies. This strategic relationship will see REY and CNFC jointly develop energy projects in the future, so watch this space. Right now, REY’s JV partners Buru and Mitsubishi are casting their exploration net across the Canning Basin to identify new oil leads – and in a big win for REY, they identified a target within REY’s Fitzroy Blocks – the Senagi Prospect. Their goal has been to identify Ungani “look-a-likes” and the Senagi prospect was identified as a stand out target by the JV. 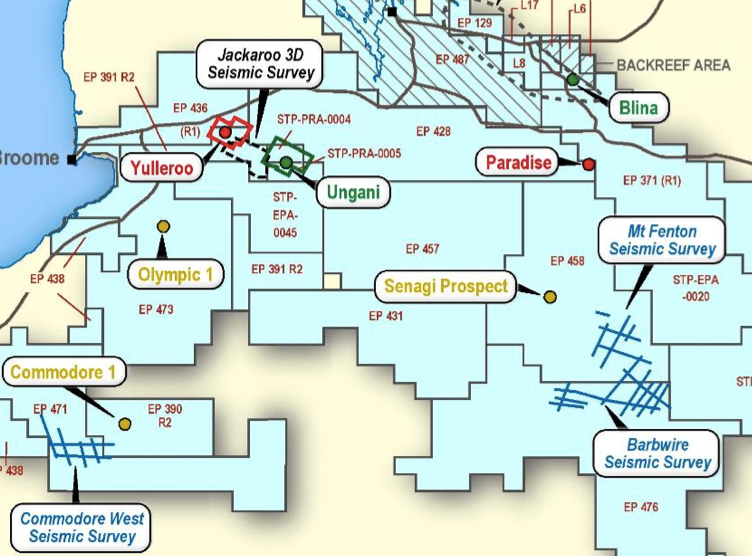 REY, Buru and Mitsubishi are now looking to drill the Senagi Prospect in 2015, along with another target that’s yet to be selected – hopefully it will be just as prospective. 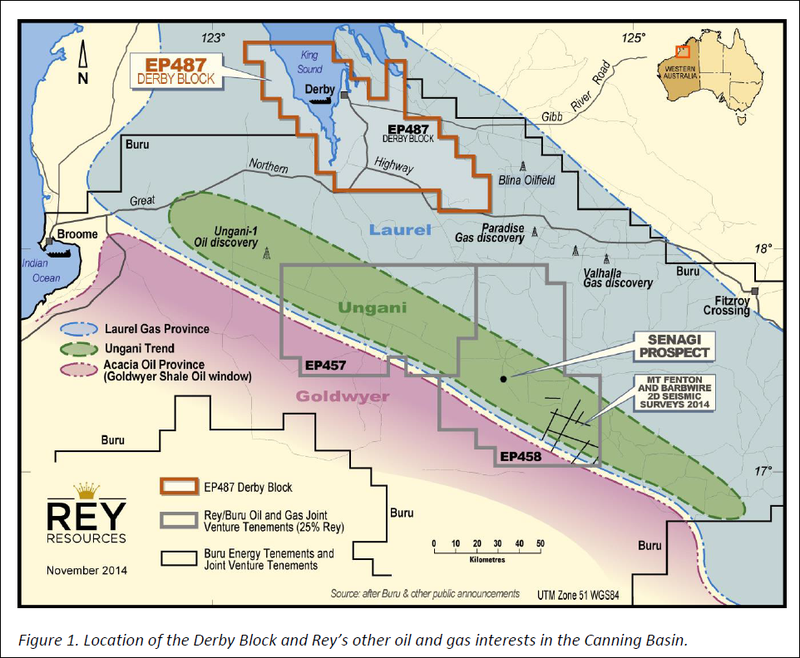 REY has also recently added to its Canning Basin play by acquiring what is essentially an option on a 50% interest in the Derby Block (EP487) to the north, which is highly prospective for gas in the Laurel Formation. This is via an agreement with Backreef Oil. ASX listed Oil Basins Limited is the owner of the other 50% and operator of the block. Ownership is dependent on the SAT tribunal giving a positive result for Backreef Oil, where Oil Basins is currently seeking to have Backreef’s grant of EP487 by the WA Government overturned. In 2014, REY and its JV partner Key Petroleum spudded a successful well named Dunnart-2 on its EP 437 block – it hit good oil shows over 20m and was suspended after 654m. The plan now is to conduct flow-back testing in 2015 on the Dunnart-2 well in March or April of 2015. Five metres of net pay will be perforated and surrounding areas will be mapped. The work should only take a week, so REY could have something to whet the markets appetite very soon. Plus, once the results of the flow-back test are appraised, REY hopes to drill once again for oil in the Wye-Knot and Condor South prospects in the block. The Fitzroy Blocks – three trends to hit? REY is planning to drill two wells in the Canning Basin in 2015 – and as you’re about to see, there are a number of targets they are aiming for. The picture above shows REY’s Fitzroy Blocks bordered in red and illustrates the three resource trends they overlap – blue for the Laurel Gas Province, green for the Ungani oil trend, and red for the Goldwyer Shale Oil Province. Ungani is conventional oil and the top priority for exploration and drilling with between 10 and 20mmbbls gross potential. Laurel is a conventional gas play in tight sandstone with an independent assessment of 56TCF of gas and 1BN barrels of oil (gross potential). 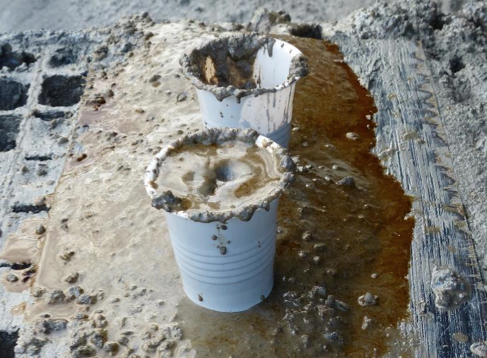 Goldwyer is an untested unconventional oil to wet gas in shale play. REY’s plan, along with its JV partners, is to unlock the value in each of these trends on the blocks by exploring and drilling. The priority right now is to fully explore and define the Ungani trend first – the rest can follow. The Senagi Prospect is a shallow structural target, which is updip from an old mineral borehole called Camelgooda 1. This well encountered a dolomite reservoir with good oil shows over 6m... but the oil was located by a metal miner who didn’t have the benefit of understanding the recent Ungani geology understanding and walked away... Bad luck for him, but good news for REY investors. 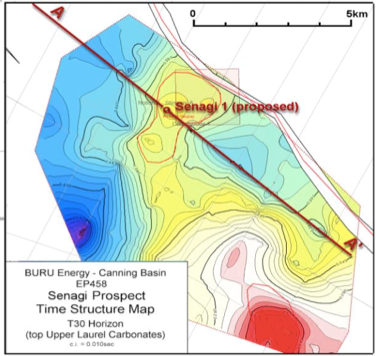 Buru is now planning to drill the Senagi Prospect in mid-2015 after the current wet season up north ends. The environmental approvals process is already underway. There is more potential in REY’s Canning Basin assets though – the Laurel gas field is an interpreted Basin Centred Gas play and it runs right through EP 458 – the same REY block where the Senagi prospect (within the Ungani trend) can also be found. Technical information pertaining to the Ungani oil discovery and Laurel gas accumulation has been sourced from Buru ASX Announcement, 8 th August 2013 . In 2015 we should be seeing a lot of activity on REY’s Fitzroy Blocks with drilling at the Senagi prospect and possible drilling aiming to strike the Laurel gas field. Remember, Buru is already producing up to 1,200BOPD from its Ungani 1 and 2 wells during extended production testing – and the Senagi Prospect is on the same trend. Add in the regional potential of the Laurel field – 56TCF of gas and 1Bbbl of oil – and the potential value uplift for REY soon starts to add up. REY’s second area of focus in Western Australia came about because work temporarily slowed up in the Fitzroy Blocks over 2014. Buru and Mitsubishi announced a review of their 2014 drilling campaigns in April and things went a little quiet for a while there. REY even went looking for outside financing to see if it could go it alone up in the Canning on the well. Not to be deterred, REY cast its exploration net to the mid-west region and picked up a 43.47% share of the EP 437 block in the Perth Basin along with operator Key Petroleum (43.47%) and Caracal (13.06%). The block is strategically located to the north of the prolific Dongara gas field and is close to the export ports of Dongara and Geraldton. The Dunnart-2 oil prospect has a best estimate prospective resource of 2.1 million barrels (unrisked, prospective resource), and a high estimate of 3.4 million barrels (unrisked, prospective resources). REY’s share of this is 43.47% – between 0.5 and 1.5 million barrels (unrisked, prospective). Not bad at all for a secondary project – after all, the real prize is in the Canning. Dunnart-2 is within the Bookara Sandstone formation in a shale-shale juxtaposition. It was drilled to a total depth of 654m then plugged and suspended with good oil shows. 2.87m of oil was found at the top of the Bookara from 614m, and a further 2m of oil from 654m. Twenty metres of total show was found through sediments into basal granites. The next step for Dunnart-2 is flow-back testing – and that is set to happen very soon indeed. Its JV partner Key Petroleum is stepping up the pace . 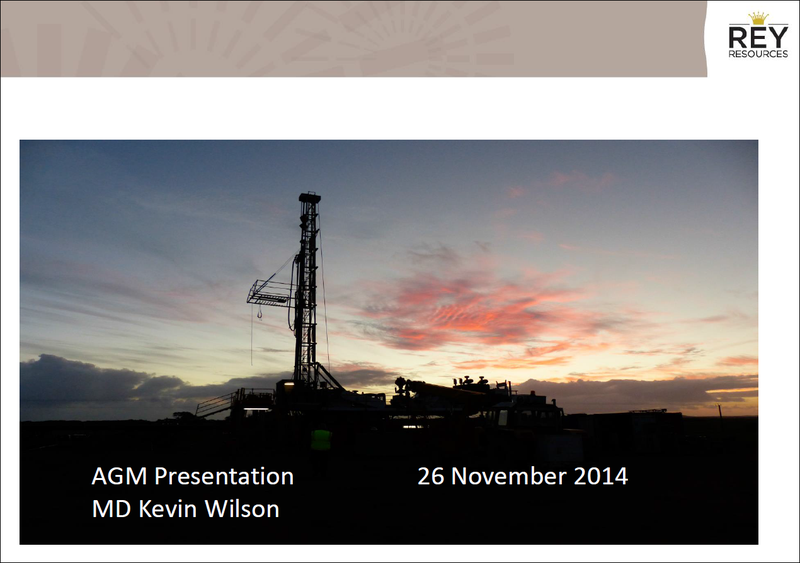 Over a one-week period in the coming months, Key will conduct a flow-back test on the Dunnart-2 well. Up to five metres of net pay will be perforated and the surrounding areas mapped at the same time. This is quick work and REY investors could soon have some results in their hands from Dunnart-2. Key has reported that all aspects of the work have gone to tender. A flexible design was developed for the production test, so an artificial lift system could be installed if a longer production test is called for. An independent estimate for Wye-Knot reported a Best Estimate of 5 million barrels and a High Estimate of 14.5 million barrels – which again REY could have a 43.47% share of. 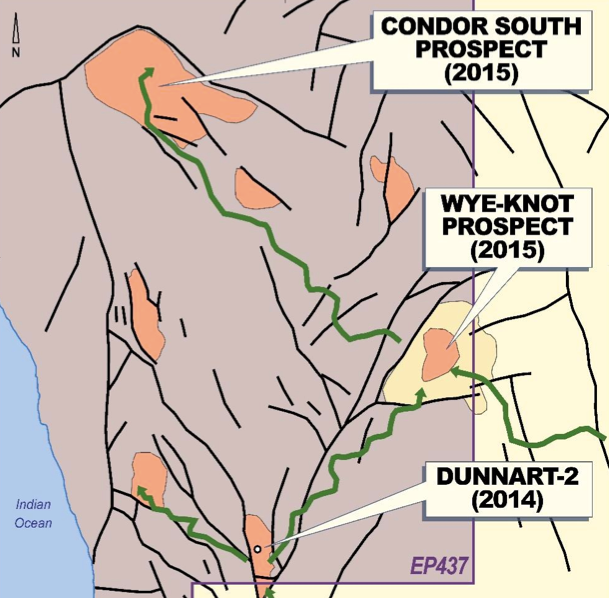 A prospective resource estimate is currently being developed for Condor South right now. 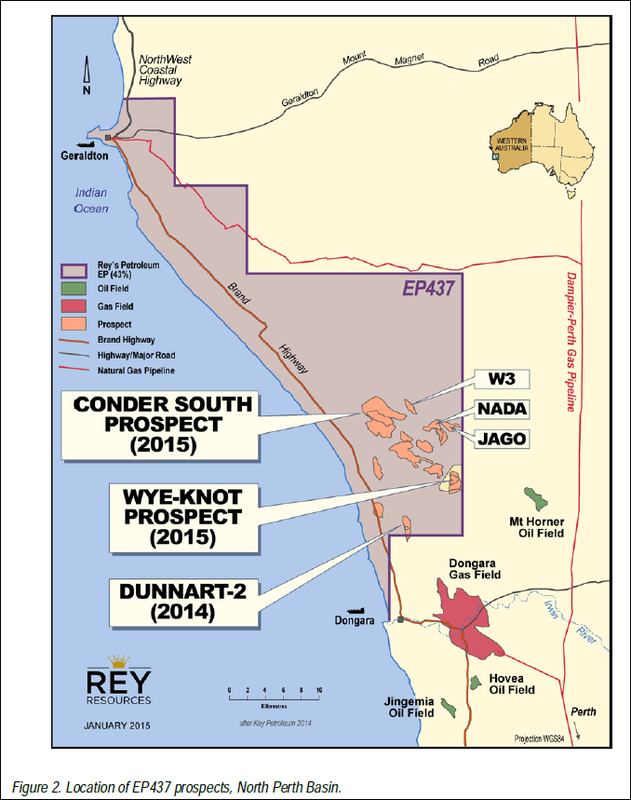 REY says it is hoping to drill at Condor and/or Wye-Knot in 2H of 2015. REY has set itself up for a rather large 2015 when it will greatly increase its exploration activity – and hopefully company value – in Western Australia’s burgeoning oil and gas regions. Up in the Canning Basin, both the EP 457 and EP 458 blocks are going to be played with a drill bit. EP 458 will see the Senagi-1 well drilled in Q2/3 and EP457 later in the year. Seismic is also expected to be shot over the two Fitzroy Blocks block over the dry season. 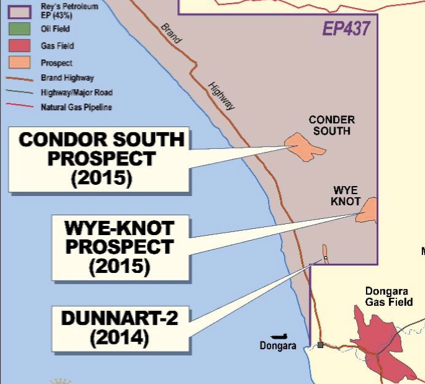 Down in the mid-west and REY’s Perth Basin play, the EP 437 block will see the Dunnart-2 oil well flow-back tested in the coming months and, with an encouraging result, the Condor and Wye Knot prospects to follow. REY has worked hard in 2014 year to set up the exploration, drilling and production catalysts for 2015.